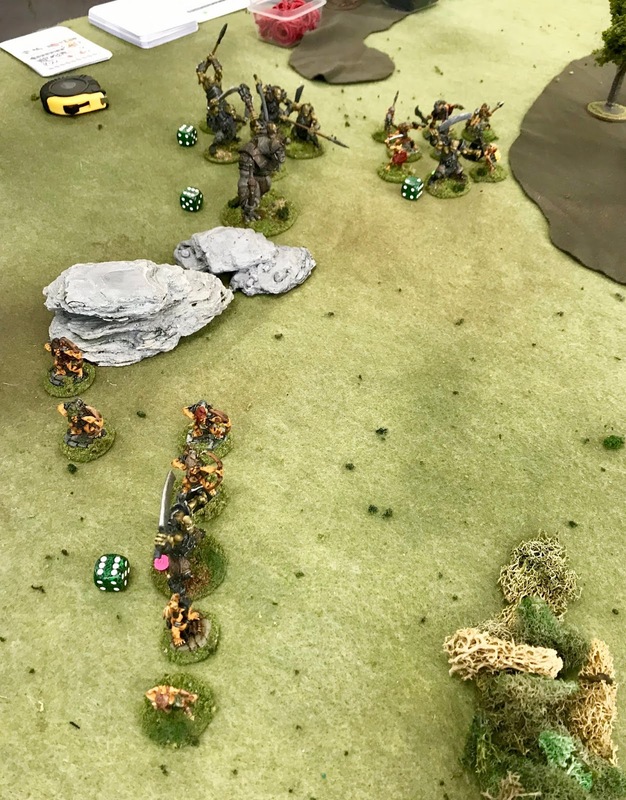 Combat Patrol: Fantasy- A Historicon Playtest | H.A.W.K.S. 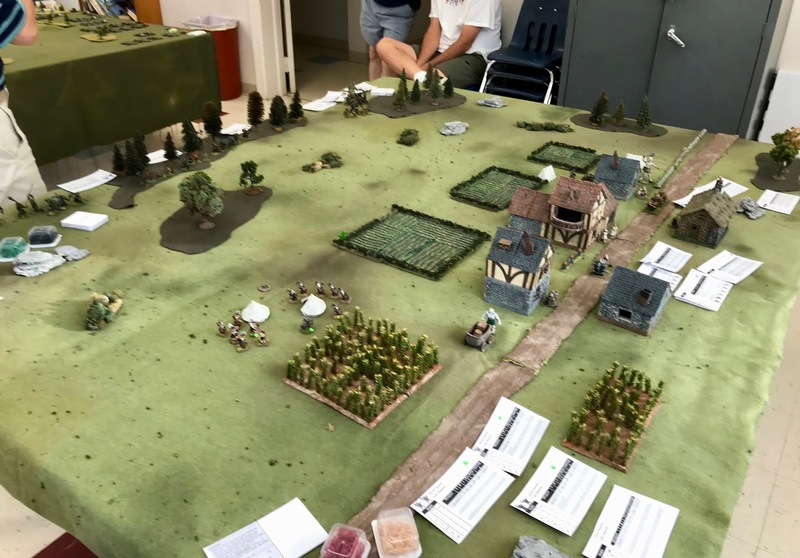 Chris Palmer At our club’s meeting last Friday I had the chance to playtest the game I will be running at Historicon next month in Lancaster, PA. It’s a fantasy battle using a upcoming Dark Ages/Fantasy supplement for the Combat Patrol skirmish rules. 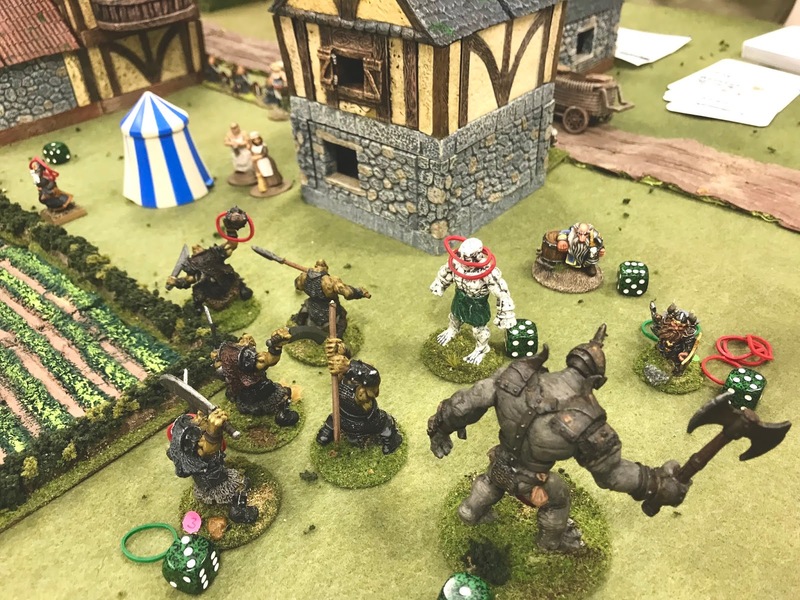 The scenario involves a Dwarven treasure caravan camped in a small hamlet for the night, which is attacked at dawn’s light by by a group of Orcs, Goblins. and Trolls. Oh, My! Though the game was designed for 6 players (three on a side), we only had four players, so split each side into two commands. Things went slowly at first as we all familiarized ourselves with the rules, but by game’s end the action was humming along. An overview of the battlefield. 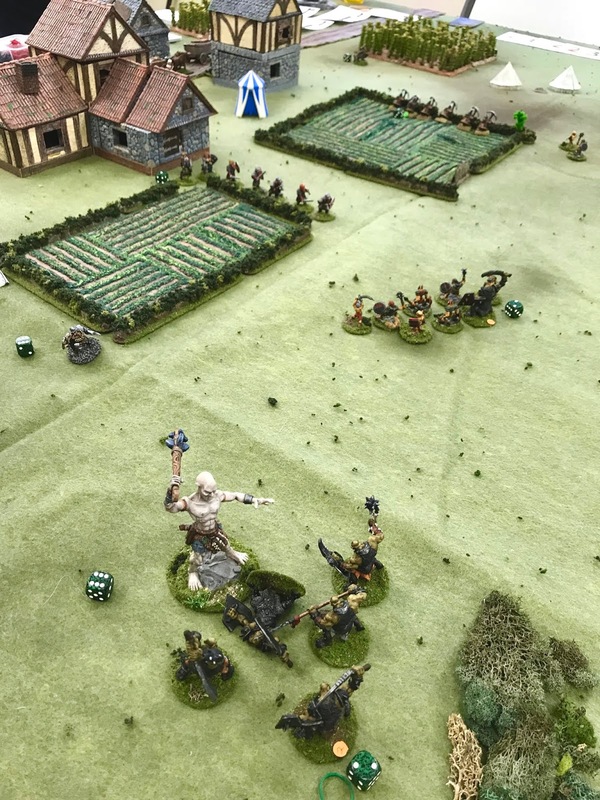 On the right is the small village where the Dwarves start, and the Orcs and their allies enter from the woods along the table edge on the left. 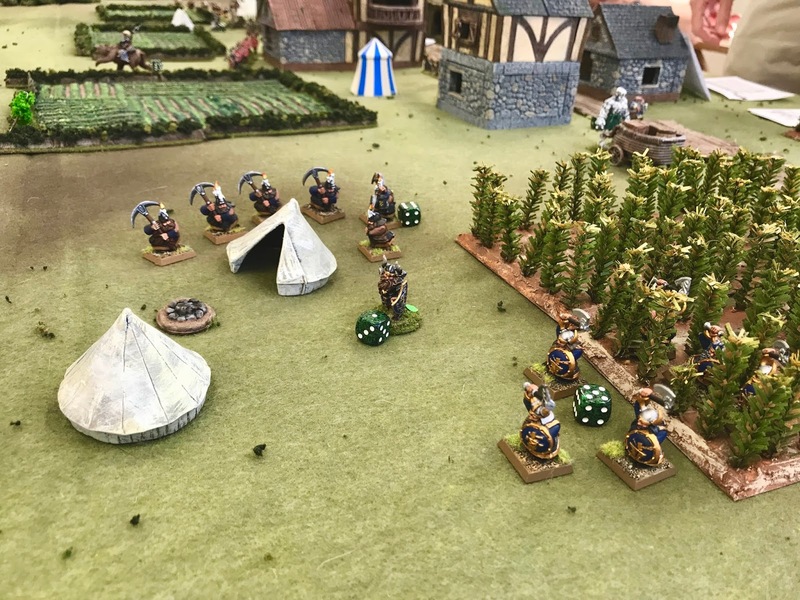 With the sound of Orc war-drums approaching, a unit of Dwarf Miners, and one of Dwarf Axemen, are roused from their breakfast and prepare a defense. The Dwarf commander, feeling a bit invincible, charges upon her trusty bear-mount directly at a unit of Orc longbows. She almost made it; but the first volley wounded the bear, which threw her and stunned her. 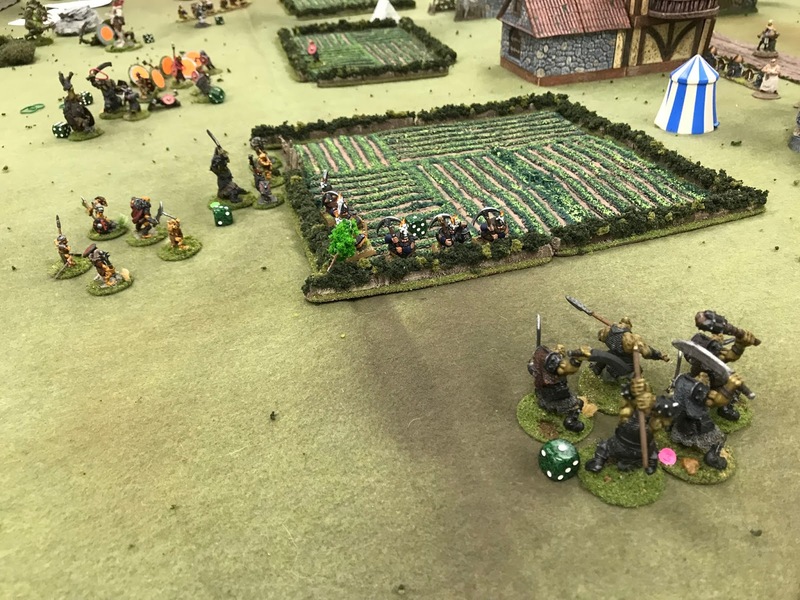 The second volley killed the bear and wounded her; and the third finished her off, as she struggled to make it to the safety of the nearby row of bushes. Back on the Orc right, a unit of Goblins harasses the Dwarven Miners, as a unit of Orc Warriors (in the foreground) run by the Dwarves and head for the treasure wagons. The Orc’s Marsh Troll moves to intercept the Giant. 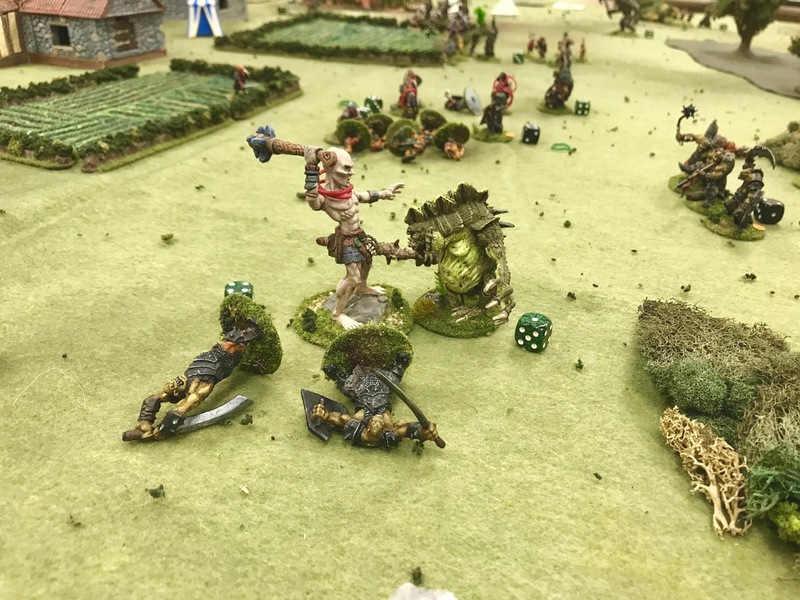 Both creatures swing their mighty clubs and connect with their opponent simultaneously: the already wounded Giant falls dead, and the troll ends up severely wounded, and one Endurance Point from death himself. The Orcs and Cave Troll on the right break through, and despite a noble defense by the Dwarves’ Stone Golem, and a Dwarven Leader, continue to make headway. The townsfolk, the last line of defense, prepare to face them in the streets. It was a great game! 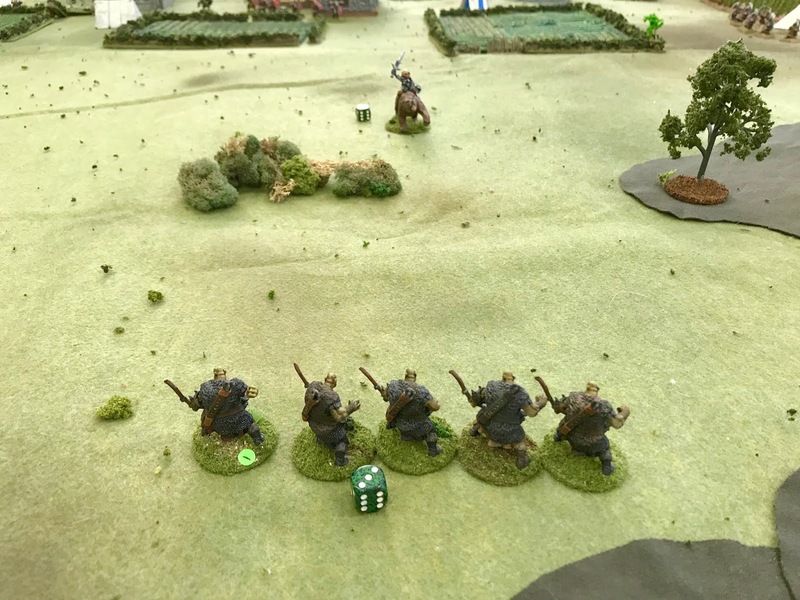 In the end, the Orc left had collapsed under the weight of the Dwarven Handgunners and the Giant’s rampage; while the Dwarven left had likewise fallen. Since the Orc’s on the Dwarven left were just inches from the wagons at the end, with nothing to stop them, we declared the game an Orc victory. Very cool, will be buying once you guys publish! Super! I think you’ll enjoy it!